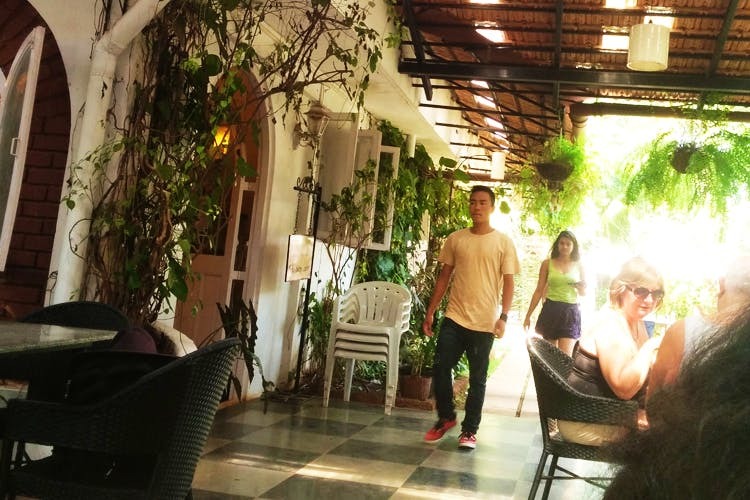 With great views of the outdoors, this cafe is a peaceful haven on the busy Candolim street, serving amazing breakfast, cakes or brownies. All that salt, sand and seawater will leave you craving something sweet, so head here for some cakes, cookies or brownies. And if you’re looking for some breakfast to fuel your beach day, have the pancakes or waffles with maple syrup. With outdoor seating and soft, soothing music, it’s guaranteed you won’t be in a hurry to leave. You must try the English Breakfast. Everything on the plate is cooked to perfection, right from the sausages to the eggs. Munch away! Please remember that the Cafe closes down during the monsoon months from June till September.